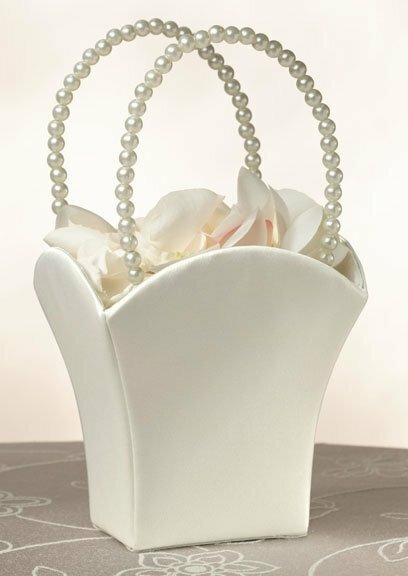 A strand of pearls make up the handles of this ivory satin flower girl basket. 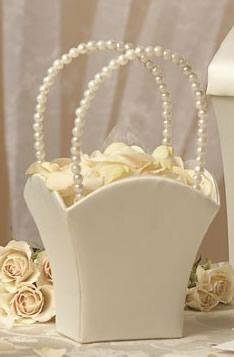 The simple ivory satin of this flower girl basket makes it a perfect match for almost any wedding decor. Your little flower girl will look lovely carrying this basket down the aisle. Fill with fresh flowers or silk rose petals. This flower basket is also available in white. Delivery times were great and staff helpful however, this basket is way too small to have flower petals in for scattering down the isle. A flower girl would be maybe 3 handfuls then it would be done. This would be a sweet basket for an under 3 year old but any older is unsuitable. I will be on the hunt for another basket!